(Left to Right): Dr. V. S. Bedi, Director and Chairman, Vascular and Endovascular Department, Sir Gangaram Hospital, launched MaxioCel along with Leo Mavely, CEO and Founder, Axio Biosolutions. Bengaluru, Karnataka, India: Introducing the latest innovation in wound care, Axio Biosolutions has launched MaxioCel, a next generation wound care dressing made of chitosan. 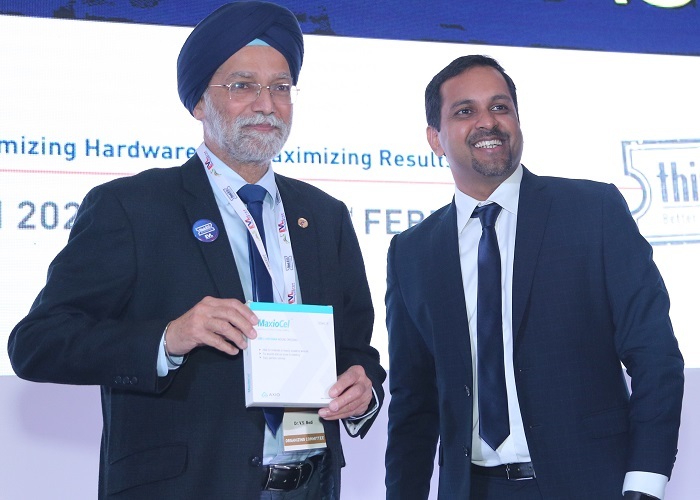 Dr. V. S. Bedi, Director and Chairman, Vascular and Endovascular Department, Sir Gangaram Hospital, launched MaxioCel at the ‘Endovascular Live 2019’ at Pullman Novotel, New Delhi. Axiostat® is its flagship product developed to reduce the mortality due to traumatic bleeding. Axio is a ISO 13485 certified company with an experienced team focused on bringing high-impact medical products to markets world-over. Axio is funded by marquee investors such as Accel, IDG Ventures and UC-RNT. Axio is today a global name that uses innovative medical technology to create breakthrough products and save people’s lives. Axiostat is regularly used by Indian Armed forces, BSF, NSG, and other para-military forces, as part of their defense kit, during their operations at the border and conflict zones such as North-East. Axio’s customers also include numerous government hospitals and reputed private institutions such as AIIMS, Manipal, Apollo, Breach Candy and Fortis among others.